The champions will release their new kit later this month. Sean O'Brien and Peter Robb celebrate their title win. 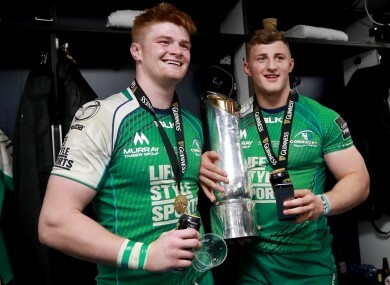 PRO12 CHAMPIONS CONNACHT have today announced that Elverys Intersport will be their new sponsor on a three-year-deal. Lifestyle Sports have been the western province’s title sponsor since 2014, but will slip off the front of the jersey again as Pat Lam’s side defend their title and head back into the Champions Cup. The deal will also see Elverys become the official retail partner with the province, reinstating a relationship they had originally formed in 2005. Connacht’s new kit for the season ahead, complete with new sponsor, will be released later this month. Email “Connacht sign new 3-year sponsorship deal with Elverys”. Feedback on “Connacht sign new 3-year sponsorship deal with Elverys”.